Too Faced recently came out with their new Natural Love Eye Shadow Collection which is their largest eyeshadow palette yet. It includes 30 shadows, comprised of popular existing shades from their natural palettes along with exclusive new ones. 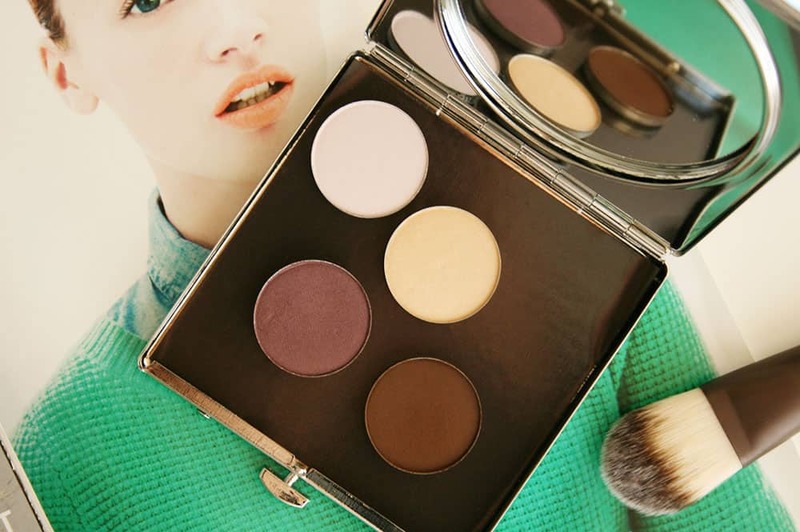 There are so many neutral eye shadow palettes on the market to choose from, so is this one really worth the hype? Here are my honest thoughts and swatches! The The Too Faced Natural Love Ultimate Neutral Eye Shadow Collection ($59) is a 30-shadow palette with 7 matte, 13 shimmer and 10 sparkle shades. The palette is intended to be complementary for all skin tones, and diverse enough to create both natural and dramatic eye looks. 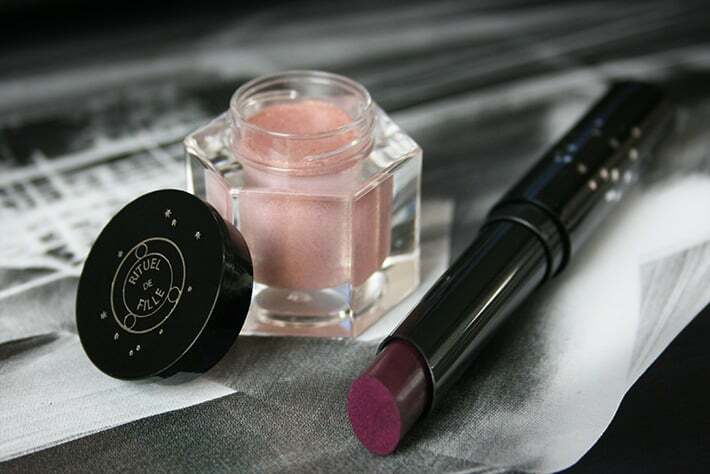 The shadows are pigmented and give good color payoff, and the texture is smooth and buttery. It also comes with a Too Faced “Glamour Guide” which features diagrammed eye looks and ideas for how to use the palette. In terms of price, yes, $59 seems expensive for an eye shadow palette. However, if you divide the price by 30 (!) shadows, it comes to just $1.96 per shadow! 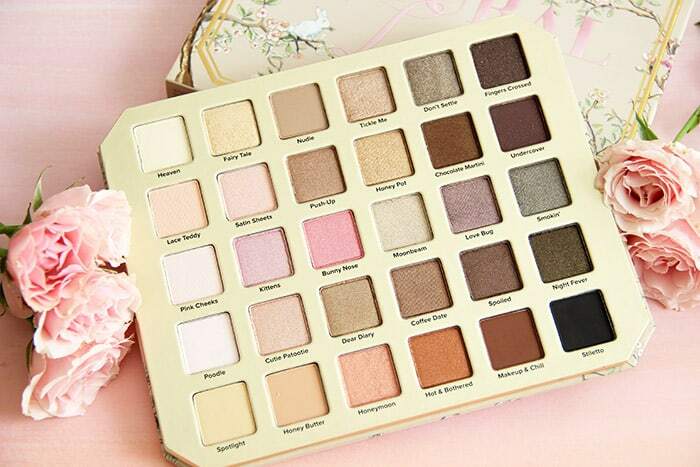 Because of this, even though the shadows are small, I think it is an excellent palette for beginners or makeup junkies that want to add a large variety of neutral shades to their collection without spending hundreds of dollars. As a consumer with lots of makeup products sitting on my vanity, packaging is very important to me. In this department, I think Too Faced absolutely nailed it. The text and artwork are embossed in a raised velvety felt, which gives it a very luxe feel and appearance. I also love this feature because most of my palettes and other products have painted text on the front, which typically fades and disappears from commingling in my makeup bag. Also, I can’t deny that the adorable bunnies really seal the deal. 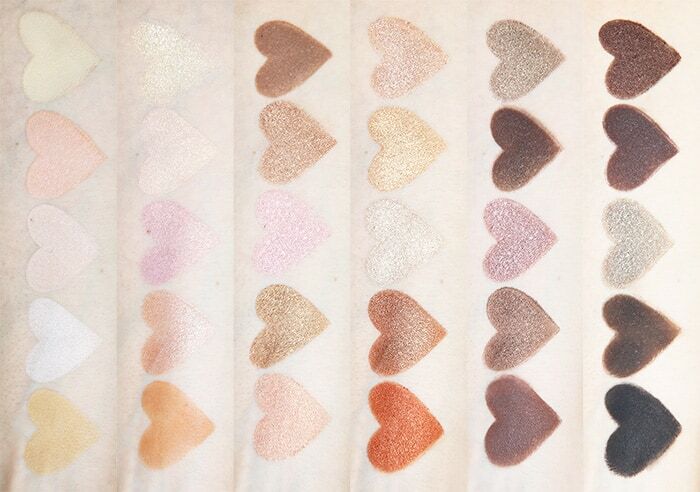 Below are the swatches of all 30 shades (in the same order they appear in the palette)! 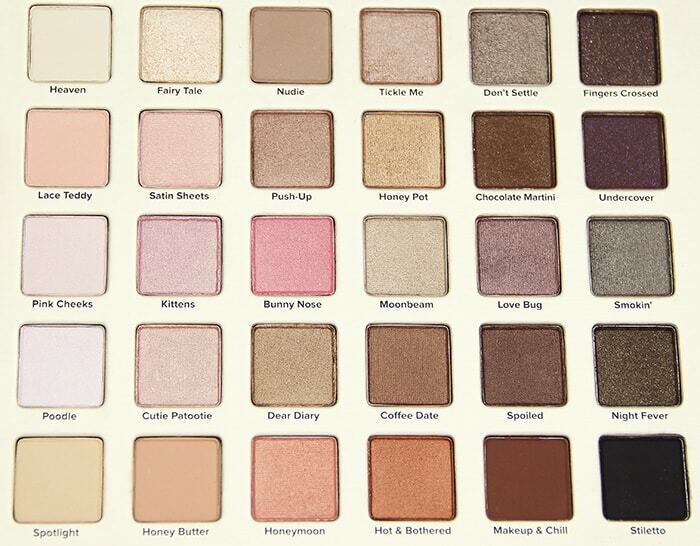 My personal favorites are the shimmer shades, particularly “Kittens”, “Bunny Nose”, “Hot and Bothered” and “Love Bug”. I like the matte shades in the palette, but I wish there were more. My least favorites are the dark sparkle shades, including “Chocolate Martini”, “Undercover” and “Night Fever”. 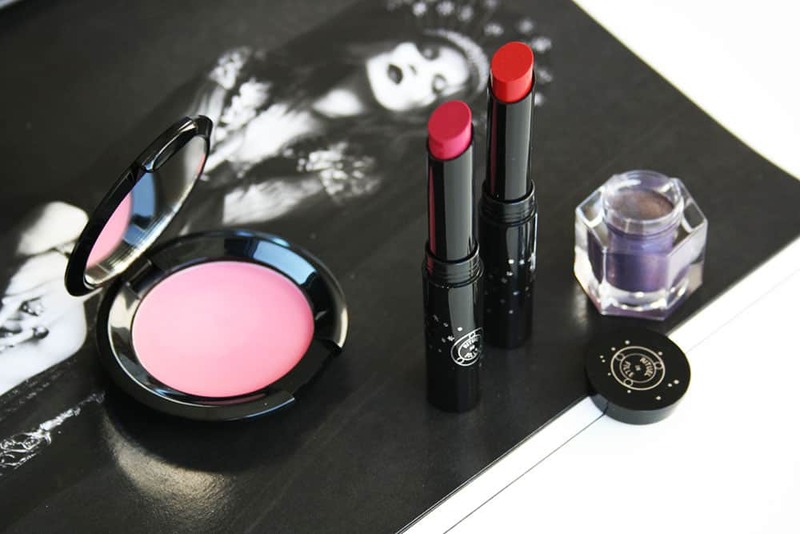 The palette is super versatile and allows you to create anything from “no makeup” looks to glamorous smokey eye looks. Most of the shadows are nicely pigmented with good color payoff, especially the shimmer shades. The texture is mostly smooth and buttery, again especially the shimmer shades. I love the packaging. I think it is gorgeous and luxurious. It is also lightweight and perfect for traveling. The price per eye shadow is $1.96. While the shadows are small, you get a large variety at a relatively small cost. It is important to note that the palette is not vegan, as some of the shades contain carmine. I hope they come out with more vegan-friendly palettes in the future! There are only 7 matte shades. Personally, I would like to see more matte shades for blending purposes. The glittery sparkle shades (such as “Fairy Tale” and “Tickle Me”) have a bit of fallout. They would work best applied with a damp makeup brush. Some of the darker shades in the palette (such as “Chocolate Martini”, “Undercover” and “Night Fever”) are a bit patchy and harder to apply. Overall I think the palette has a lot of beautiful and diverse shades, perfect for creating tons of different looks. If I could change anything about the palette, aside from making it vegan-friendly, I would add more matte shades and would possibly change the formulation of the darker sparkly shades to make them less patchy and more pigmented. In my experience, Too Faced palettes have been hit-or-miss, but this one is a bit of both. All things considered, I think it’s a lovely palette, and it would make an excellent addition to any makeup lover’s collection. Have you tried this palette? If so, I would love to know your thoughts, and which shades stood out to you the most! You can find it at Ulta or Sephora and it retails for $59. I’m confused. I thought you said last year you wouldn’t feature products with a parent company that tests on animals, but Too Faced was recently bought by Estee Lauder. I used to buy Too Facd until they were bought. Has EL said they wouldn’t sell Too Faced in countries that require testing? Yeah, there are definitely pros and cons to supporting cruelty-free brands which are owned by parent companies that test! Thanks for sharing!